In the front row, from left, are Kate Coffey, Martha Gioumousis and Lynn Veenstra. In the middle row, from left, are Gary Ferguson, Linda Brown, Stephanie Andersen, Paul Paradine, David Kuckuk, Chris Griffin, Mary Roberts and Nicole McPherson. In back, from left, are Jim Dennis, Carol Beeman and Duane Ross. 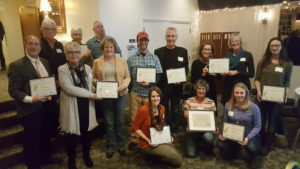 The Tompkins County Community Beautification Program recognized businesses, civic associations, community partners and volunteers who have contributed to beautification efforts at an awards ceremony at La Tourelle on November 10. A new awards program was launched this fall to recognize businesses and civic associations that contribute to community beautification in the City of Ithaca and Tompkins County. Winners were selected from nominees in four categories: Business, Civic Association, Residence, and Placemaking. Tompkins County Legislator Jim Dennis presented the awards. The Community Beautification Award for a Business was presented to Ithaca Agway for their colorful landscape plantings on either side of their building on Route 13 and on Fulton Street. Staff Linda Brown and Stephanie Andersen are responsible for planting and maintaining the gardens and accepted the award for Agway. The Community Beautification Award for a Civic Association went to the Groton Public Library for outstanding landscape plantings in front of the library on Route 222. Volunteers Chris Griffin and Mary Roberts replaced the existing evergreen shrubs with flowering shrubs and perennials and maintain the garden each year. The Community Beautification Award for a Residence was presented to Lynn and Kate Coffey for their excellent curbside garden at the corner of Farm and Aurora Streets in the City of Ithaca. Flowering annuals and perennials are planted in the stone-edged bed, and a free little library next to the garden is colorfully painted to match the garden. Press Bay Alley on Green Street received the Community Beautification Award for Placemaking for transforming a formerly unused alley into a vibrant space for pedestrians and customers with tables, chairs, planters and landscape plantings. David Kuckuk and John Guttridge, developers of Press Bay Alley, received the award. Five volunteers with the Beautification Brigade received the Super Volunteer Award for outstanding service this year: Linda Bartnick, Carol Beeman, Louise Sallinger, Lynn Veenstra, Nicole McPherson and Carol Eichler. Community partners were also recognized at the event. Jeanne Grace, Ithaca City Forester, and Duane Ross, Department of Public Works, received awards for assisting with watering plantings during the summer drought. Gary Ferguson accepted an award for the Downtown Ithaca Alliance, which provided support for the new plantings on the Ithaca Commons. Bruce Lane, owner of Purity Ice Cream, was recognized for his support of beautification plantings on a median near his business. Paul Paradine of NYSEG was honored for his beautification contributions at the City of Ithaca pump house on Route 13. Scott Wiggins, owner of La Tourelle, was recognized for hosting the beautification program awards program. Martha Gioumousis, Community Beautification Coordinator, was also recognized for the design of this year’s exceptional plantings on the Ithaca Commons, and for developing creative approaches to watering during the summer’s severe drought.